Has it ever happened to you to ask a waiter for something, who says “Sure, no prob”, and then he or she shows up with something different and then runs off, disappearing? My father in law, Miguel, has a funny comeback for these situations. He got it from one of his law professors in university when he’d get answers to questions he did not ask. Miguel says he sometimes feels like saying: “Now that you’ve brought me whatever you felt like, could you please bring me what I asked for!” However, I’ve never heard him use this line. I’m guessing he’s too much of an experienced gentleman to answer this way. Crucial to effective communication and team performance is mastering the art of requests. We practice this in my seminars. The goal is to know what we want, why we want it and how we’ll get it. Need = The Problem, Why: It’s a vital element to our wellbeing as humans. Thirst, tranquility and safety are examples. Notice that – physical, psychological or spiritual – we all tend to share similar needs. Here’s a list of common needs. Want = The Solution, What: It’s an answer to satisfying a particular need. If you’re thirsty you might want water; if you need some peace you could desire silence; if you need safety you might want a new door lock. Our wants are the choices we make to respond to our needs. Notice wants are one of many options. Instead of water you could want a soda; music instead of silence; a Rottweiler, not a lock. Unlike needs, wants are informed by our environment. For ex., the need for clothing can result in wanting the clothes informed by the fashion culture. Request = The Strategy, How: It’s the act of petitioning something from someone for the purpose of satisfying a want or a need. Ex: You could ask your partner for water, your colleague to turn down the music, or the landlord for a new lock. Requests are strategies we use to satisfy our wants and needs. Notice once again how a request is one of several strategies. You could have decided to get the water yourself, move to a quieter room, or change the lock on your own. If we confuse the three, we end up requesting things we don’t want and wanting things we don’t need. We confuse problems (needs) with solutions (wants). We neglect the strategies (requests), forget the why (needs) and focus only on the solution (wants). 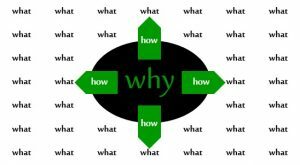 A tool for when we don’t get what we want: Ask yourself: What is the real problem (the need, why)? Are there other solutions (the wants, what) or better strategies (the requests, how)? Now adapt your wants and requests to meet your needs! When a request is the best strategy, we want to trigger willingness from the receiver, not denial. We’ll discuss how to do this in following entries. Comments? Questions?